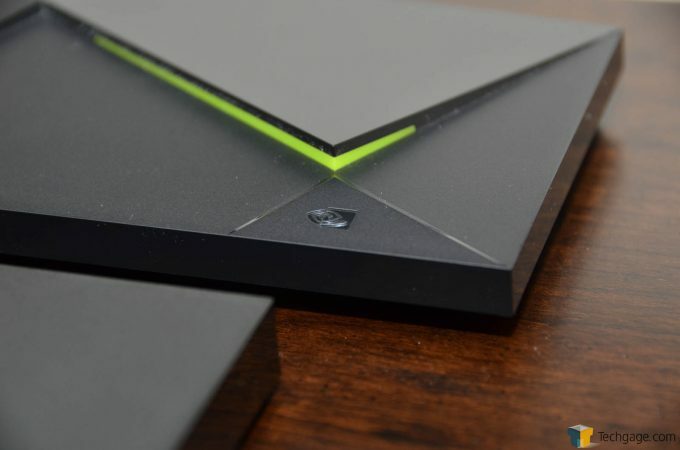 NVIDIA’s first generation SHIELD Android TV released only a couple of years ago, but a lot has changed in that short amount of time. Home automation and streaming technologies have taken off, and NVIDIA looks to address them with this second iteration. As an added bonus, everything else gets a good polish, making this a crazy attractive set-top streamer. Earlier this year, we had an opportunity to sit down with NVIDIA at CES 2017. What was discussed turned out to be an extension of what NVIDIA’s CEO Jen-Hsun Huang had said the previous night at the opening keynote of the show. Not only was NVIDIA aggressively – pardon the pun – driving the autonomous automobile market forward with its PX2 platform, the Santa Clara company also outlined its vision for the living room of the future. By updating its existing SHIELD TV, NVIDIA intends to become the ultimate connected home appliance by consolidating entertainment, games, smart-home functionality, music and live TV. If a lot of what we cover in this review appears familiar, it might be because you read Ryan’s excellent look at the previous version of the SHIELD TV. The two SHIELDs share most of the same internal components. Both are powered by Tegra X1, and now, due to the attention of NVIDIA, both run Android 7.0 (Nougat). That however, is where the main similarities end. The new SHIELD TV (2017) will herein be referred to simply as the SHIELD, ships with a newly designed controller and remote, both with voice functionality. Gone is the 500GB internal hard drive and microSD slot, allowing for a much smaller footprint. The new SHIELD TV itself is small. So small that it might be overlooked sitting in an entertainment center. By removing the internal hard drive, NVIDIA aimed to make the streamer as diminutive as possible. Inside the SHIELD is the same Tegra X1 chip that powered the unit Ryan looked at, as well as 3GB of RAM. Internal storage is a paltry 16GB but that can be expanded by using an external USB drive connected to one (or both) of the available USB 3.0 ports. For Internet connectivity, users have the choice of a wired Gigabit or wireless AC connection. Wireless, for me, is preferred, but in some cases that we’ll touch on in a bit, a wired connection is a better idea. Rounding out the features of the SHIELD, we have Bluetooth 4.1, HDMI 2.0 with HDCP 2.2 (to display 4K 60Hz HDR and DRM protected content) and pass-through support for Dolby Atmos, Dolby TrueHD, Dolby 7.1/5.1, DTS-X, DTS-HD Master Audio, and high-resolution audio playback up to 24-bit 192 KHz. New to this SHIELD is a completely redesigned controller. Communicating via Bluetooth 4.1 for ultra-low latency, the new controller actually feels good in the hands. It isn’t quite as curvy as the Xbox One controller, but they are very similar in size. In fact, the new SHIELD controller’s overall shape looks similar to the One controller, has the layout of the PS4’s, and looks as if it was rendered with the PS1 Virtua Fighter game engine. Its body has a polygonal wireframe appearance to it that really helps it stand out. With all the necessary Android and voice buttons, the controller truly becomes a gaming controller with tactile buttons, quality textured thumb sticks and a D-pad that works well. Built into the controller is a volume slider that runs vertically from the buttons on the bottom of the controller, between the thumb sticks and up to the voice control button. The controller has an integrated IR blaster and dual vibration feedback motors as well. With all the comfort and functionality of the controller, the battery is expected to last up to 60 hours and can be recharged via the provided micro-USB cable. In our testing, we charged the battery when the kit was first received and in the 4 weeks of testing, we’ve not yet had to recharge. The SHIELD also ships with a remote. Similar to the remote Ryan looked at a year and a half ago, the remote used to be $50 extra but is now included in each box that the SHIELD ships in. While the previous remote is still available for purchase, all it gets you is an integrated headphone jack and a rechargeable battery. If those are of no concern to you, the new remote is a welcome addition to the bundle. Featuring an IR blaster, volume slider, capacitive sensing technology that automatically turns off the remote when it not in your hands, and Bluetooth connectivity, the new remote can run for up to a year with a pair of replaceable CR2032 coin-cell batteries. I initially thought this was a mistake but after considering how often I’ve changed the batteries on my PlayStation or television remote, it quickly became much ado about nothing. While the hardware that powers the SHIELD is impressive, it’s the software that truly lets the device shine. If we only take into consideration the Google Play marketplace, we have more than enough functionality to make the device the entertainment backbone in any connected home. Add onto that Netflix, YouTube, Amazon Video and Google Play movies and you find yourself with hooks into most major streaming sources. Oh, and all of those listed streaming services play in stunning 4K beauty on the SHIELD. Amazon Video and Netflix both offer HDR as well. If that wasn’t enough, let’s consider the gaming possibilities with the SHIELD. With the Tegra X1 chip, playing what NVIDIA refers to as “console-class” games on the SHIELD is simple and mostly free. The only issues I ran into were in playing the “made for Android” version of Half-Life 2. There were a few times when the game would stutter, but I’m unable to point to an exact reason for that, as it happens on my SHIELD portable at times as well. It wasn’t often but it would lag for a few seconds before catching up. Playing the same game streaming from my GTX 1080 powered desktop was issue free. Playing different games, for example The Witness and Doom 3 BFG, produced hours of problem free gaming. Another nice option on the SHIELD is to install one of the many emulators available on the Google Play store and load up all your favorite ROMs (although it’s not a use case NVIDIA is going to emphasize for probably obvious reasons). While that’s all good on its own, the biggest draw for many will be the integration into the existing gaming ecosystems many of us have already invested heavily in. For NVIDIA GPU users, the SHIELD acts as a streaming client on your network, allowing you to stream your favorite games from your PC. With your Pascal powered PC doing all of the heavy lifting, the SHIELD simply takes the gameplay from across your network and displayed it on your television. For testing, I played multiple hours of Borderlands 2 and Far Cry 3. The experience was seamless and without lag. Finally, we have the GeForce NOW subscription service. For gamers without an expensive gaming PC (but with a high speed Internet connection), a GeForce NOW subscription gives you access to a growing library of games (at time of writing over 125 “high-quality PC games”, rendered in NVIDIA’s own Pascal powered cloud and streamed to your SHIELD). The cost is $7.99 per month but keep in mind that it is different from the soon-to-be released GeForce NOW subscription service for Macs and PCs. NVIDIA promises first run title availability going forward so when a new game comes out that catches your attention, you won’t have to wait to play. However, this all comes with caveats. NVIDIA recommends at least a 12 Mbps download speed for 720p quality gaming and 50 Mpbs for 1080p60. Most ISPs offer tiered broadband packages so getting to a speed that allows you to play how you want can be as simple as calling your ISP and upgrading if needed. One thing out of your control is that NVIDIA also recommends a ping time of less than 60ms to the nearest GeForce NOW server. NVIDIA doesn’t advertise where its datacenters are located, but pick the nearest major metropolitan area and run a speed test. For me, I chose Chicago. 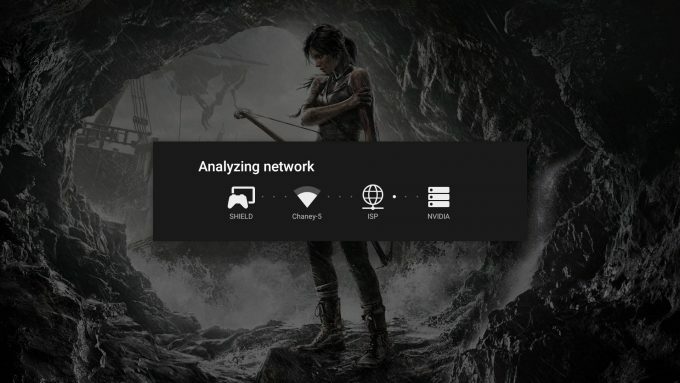 There is also a network testing utility baked into the SHIELDs operating system that will give you a good idea of whether or not you’re likely to have a good gaming experience with GeForce NOW. The last requirement is a 5GHz WI-FI router. NVIDIA has a list of approved routers but it’s in desperate need of being updated. I had no issues connecting to the Synology AC2600 router we are currently testing. My home theater setup for some time has revolved around XBMC (now KODI). I originally had a small PC built that I had KODI running on. When we upgraded our furniture in the living room, that PC no longer fit in the new entertainment center so I switched over to the stellar ASUSTOR AS6104T. It was a NAS that we had laying around from our review last year and I thought it would be a good low-power alternative to a full powered PC. That NAS worked wonderfully for KODI, but like the PC, it was awful for Netflix, Hulu, and Amazon. My only option was to either run them in Chrome or switch over to our smart TV. I was left with a great solution for KODI but nothing more. The SHIELD perfectly brought all those features together in a single interface. Another added bonus for KODI is that when an update is released by the KODI team, it’s pushed to the Google Play store, making the updating process simpler for the end user. Media consumption on the SHIELD is made incredibly easy. The UI is perfect in its three row organization and with the remote, navigation is a breeze. 4K content from both Netflix and Amazon looks amazing during our testing, as we did not experience any buffering issues. Gaming on the SHIELD, as we briefly touched upon, was almost perfect. There were a few issues with the made-for-Android Half-Life 2, but other games ran flawlessly. Streaming from my PC was a smooth and trouble-free experience as well. I did run into a few lag issues when playing Tomb Raider on GeForce NOW but for the most part, that was a good experience as well, though the game was running at 720p. For $200 US, the SHIELD has a lot to offer. The addition of a remote and controller is a welcome sight and goes a long way to round out the overall offering. Yes it runs on the same hardware that the unit Ryan looked at 18 months ago did, but in our testing, we never ran up against a performance wall. For anyone looking at the SHIELD, your bottleneck is inevitably going to be your Internet connection. Gaming alone, however, is not the primary reason to look at the SHIELD. It’s the combination of all that it offers that truly makes the product an attractive option. 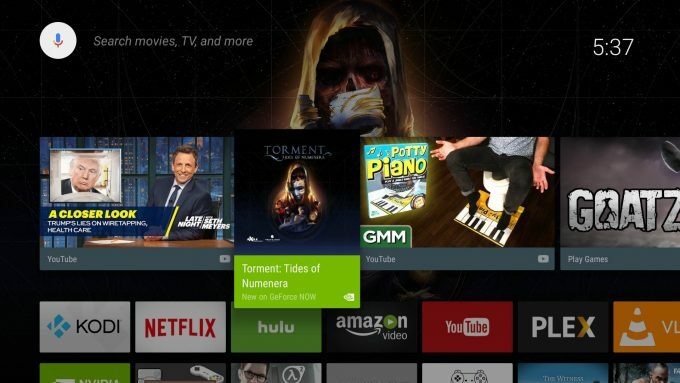 Taking the features of a smart TV and throwing them on fast hardware, adding in the ability to tie into the Google Play ecosystem for apps and games, and then adding to it all the advantages that NVIDIA brings with it and you have an incredible option for home entertainment. This doesn’t even factor in the future capabilities of home automation once the NVIDIA Spot starts shipping. So what’s the alternative? For 4K streaming, one could go with the Amazon Fire TV or the Roku Ultimate. Those will set you back $100. For living room gaming, one might consider the Xbox One or the PS4. Those will be another $250-300. If you want home automation, the Amazon Echo is a possibility and will cost you a little under $200. Finally, if you want to extend your PC gaming experience outside of your monitor, you can pick up the Steam Link and controller for around $100. Or, and this assumes you already have a Pascal powered PC, you could get the SHIELD to do all of these functions for $200. The SHIELD is not perfect but it’s very close and with the new model being a slight improvement over the older one, NVIDIA is trending in the right direction. Now, how about a new tablet and/or portable? Comparatively speaking, it’s affordable given the functionality. The Google ecosystem is vast. Supports 4K and HDR content. Includes a remote and redesigned controller. GeForce NOW offers a viable alternative to owning a gaming PC. Ability to stream games from your PC allows gaming on any TV in your home. While an improvement, not a substantial upgrade from the previous SHIELD TV. GeForce NOW is affordable but still subscription based.